I’ve got a gut feeling. And have you ever felt sick to your stomach with nerves or had butterflies in your tummy just before you step up to do a presentation. Maybe you’ve met someone and your tummy feels a bit off. Or when you’re sad, you’re hit with a pang right in your gut. Your gut is your second brain. It is connected to your emotional and mental wellbeing. AND it is vital in our decision making process. Why? There are hundreds of millions of neurons connecting the brain to the entric nervous system. This part of the nervous system is responsible for controlling the gastrointestinal system. Basically, the digestive system / gut needs its own ‘brain’ to operate. Now the question needs to be asked is it just to manage digestion or could it be that the second brain in our tummy is also there for us to listen to. I have long been an advocate of listening to my gut and know that when I learnt to let go of some of my controlling ways and listen closely to what my gut ‘had to say’ things started to turn around for me. The gut instinct is your first reaction. It’s when our experience gets filed away in our brain and exposed to ‘logic’, experiences of the past and personality factors that things get muddled, decisions are slowed right down or not made at all. That’s when we get stuck and stagnant. Acknowledge the feeling in your gut when you think about something or meet someone for the first time. Think about that feeling and what it may mean before you send it up to the first brain for analysis. Look out for messages from the universe and synchronicity. Being open to signs and what they could tell you and how your gut reacts to those coincidences will be like having your very own mentor to run things by all the time. Make space for decisions and get in touch with your emotions rather than squashing them down through practicing mindfulness and meditation. 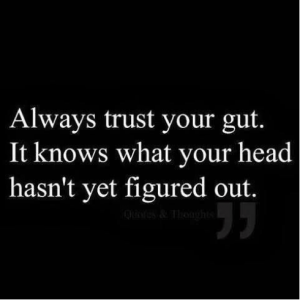 Think about all the times you went with your gut instinct and how it worked out for you. Mostly positive, I bet. 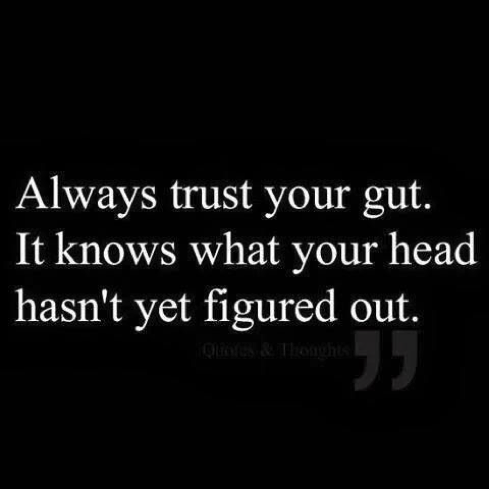 Think about all the times you IGNORED your gut instinct and went with your head instead. I am imagining those decisions didn’t work out so well. So guts aren’t just for digestion. They are the first point of call around intuition before reasoning and analyses take hold. Our gut instinct is a gift but it’s a gift that many choose to keep unwrapped under the tree. Tell me, when has your gut instinct been bang on target?